In a dense forest in Canada, live 2 wolf packs. They live in an area that has not been discovered by humans. The two packs live close to eachother, and often cross paths. They hate each other immensly, and fight often. One pack is called Stormpack, and the other, Shadowpack. Stormpack has generally stronger and more aggresive wolves, while Shadowpack has weaker but smarter wolves. The winter there is harsh, and many cubs die. Will you survive? 4. Try to keep cursing to a minimum. 9. Try not to spam, if you want to talk out of character, use parantheses. 10. Please don't use chat-speak! What are all these ranks? Alpha Male/Female: These are the strongest wolves, usually biggest and most powerful. Have a strong influence over the pack. Beta Male/Female: The second-strongest wolves. Usually, if the Alpha Male/Female gets injured or sick, they will step in and help out the pack. Delta Male/Female: These wolves are training to become Beta, and eventually, Alpha. Elder: These are old wolves; who have served their packs loyally. Warriors: They mostly fight for the pack. Pups: Wolves younger than 1 year of age. They began training at 6 months of age, but become a Hunter when they are a year old. Omega: The lowest rank in the pack. These are usually wolves that have broken rules of the pack, or are very weak. They usually stay behind on hunts to watch pups. Looks: She is a pure black wolf with a tiny bone structure, which allows her to take quicker twists and turns than some/most wolves. History: She doesn't remember, she has long term memory loss. Rank: Hunter - She usually likes to hunt alone because she does something that, from what she's seen so far, others don't. Looks: She is the total opposite than Elemiire. White with, very very pale, blue splotches everywhere. History: She didn't have a very good history. She was abandoned by both of her parents and her siblings because of her 'odd' coat colors. No one in her family had a pale blue color on them. Looks: Regen is a large female though she was once the runt of her pack. Her coat is a light mouse-grey color with darker flecks that look like burns near the tips, giveing her a cinged sort of look. With eyes a bright and piercing silver, silver and darker flecks of gold, they seem to speak her soul and the love she has for her pack. Personality: Regen has a haughty personality. She doesn't usually take no for an answer and is never one to back down from a fight if she know's she can win. Though her rashness often gets her in trouble, she does have a careing side, and will stop at nothing to help her pack in times of need. History: Regen was once born the runt of her litter, and, being the smallest, was not though to survive for long. Though she did in fact grow up healthy, she was always an outcast and that was what drove her to become the strongest, so that she may never experiance that feeling of weakness again. Looks: Mystique is silver, she has a long, fluffy tail. Her eyes sparkle like an ocean, they're blue. History: None of her history was depressing other than her brother dying when she was younger. Looks: light grey legs, under bit of tail, chest and muzzle, and black one his back, tail and muzzle, Light blue eyes and three scars going down his right eye. 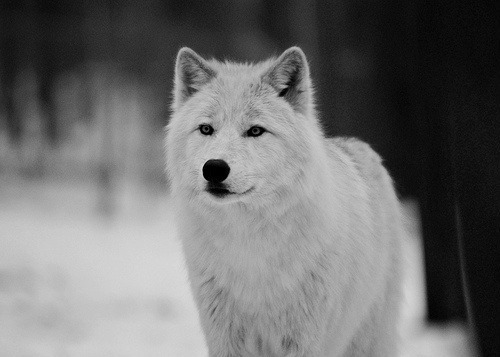 Personality: quite wolf, he prefers to keep to himself, but he will fight to protect his pack. His eyes are deep and full of mystery, as he doesn't tell much about himself. He has very sarp eyes so he see's very well. History: He got attacked and chased out of his family pack by his uncle who took over the pack in fear of him taking over when he was 3. He wondered the land for a year till he joined this pack. Rank: "Huntress or warrior. Either way, I'm killing." Crush: "I suppose you have to impress me, boys. But trust me, it isn't easy." Personality: Thalia is a tough wolf; strong, brave and bold. She isn't afraid of death, and is always prepared to take a risk. Thalia is headstrong and rude, she often uses sharp sarcastic remarks and tends to start fights easily; that's one of the reasons she tends to stay away from others.